We asked our readers for their best call-ending or call-closing statements. STEP 1 – Briefly summarise what has been accomplished on the call. STEP 2 – Let the customer know what happens next (and include a timescale – so they can go about planning their busy lives). STEP 3 – Ask the customer if there is anything else that they can be helped with. STEP 4 – Finish with a courteous call-closing statement. 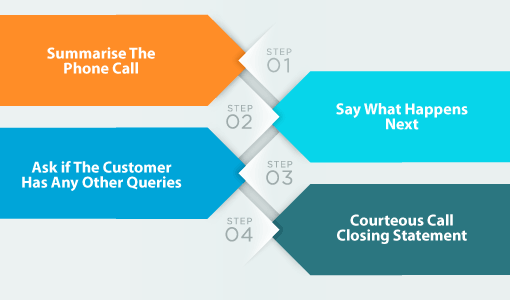 When we quizzed a group of almost 30 contact centre professionals, over half agreed that each of these steps was vital when closing a call. This is highlighted in the chart below. We contacted a number of different call centres of household name companies to find out what statements their advisors use to close calls, creating a list of eight statements in the process. Then we ran a poll on LinkedIn to find out which statements our readers liked best, with the results being highlighted below. Reassuring the customer of the contact centre’s support for queries is a nice gesture of the advisor’s willingness to make the customer’s life easier. Offering this reassurance is something that this statement does well, as no matter the stage of the call, it is always good practice for an advisor to signal to the customer that they are valued and can be supported round the clock. Also, this could be a particularly good phrase to use if the customer has been given a lot of information or is rushing through the call because they are in a hurry. It is interesting that both of the top two call-closing statements begin with “thanks for calling”. It seems that this simple “off the cuff” phrasing was popular with our professionals. Perhaps this shows the value of keeping the tone of the conversation less formal by using “thanks” and not “thank you”. Using these shortened terms to sound more human contrasts with the robotic, script-led impressions many customers have of contact centres, and encourages more natural communication. This is a nice call-closing phrase to use if a contact centre is looking for its advisors to do more to personalise their calls and repeat the customer’s name. However, the decision to use Mr/Mrs X or the customer’s first name is a difficult one, as it is important to address the customer in the appropriate manner. While some customers may prefer Mr/Mrs, many believe using the customer’s first name is a shortcut to building rapport. So, if an advisor believes that the customer has a preference, it is good practice to record that in the CRM system, so future advisors know which to use. 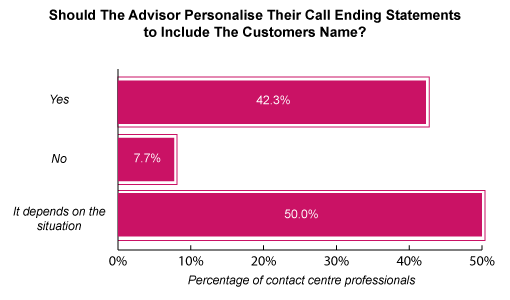 Either way, more of our contact centre professionals believe that advisors should personalise their call ending statements by addressing the customer by their name, than those who do not. This is highlighted in the chart below. For more on this topic, read our article: How Should We Address Callers? This may be quite a long call-ending statement, but it definitely covers all the bases in terms of using the customer’s name, thanking them for their time and wishing them well. Also, in amongst this phrase is reference to the company’s name, which could be good to include if the interaction has gone well. Why? Because it reinforces that this good experience was delivered by the company and not just a helpful advisor on the inside. However, this may only be good practice in the closing statement, as encouraging advisors to use personal pronouns with the customer in other parts of the interaction may improve rapport. Using some of the other statements included in this list may be bad practice if the call has not gone well. Saying something like “I enjoyed talking to you” would not be a good thing to say to an abusive customer. For example, saying something like “I enjoyed talking to you” would not be a good thing to say to an abusive customer. However, this statement does a good job of addressing the issue and taking ownership of it on behalf of the organisation. Using a phrase like this will depend on the small talk that went on over the course of the conversation. By using a statement of this nature, the advisor is personalising the call and building on any rapport that had been created over the course of the interaction. Try and commend or praise the customer. When they are made to feel great, they tend to give positive results when surveyed or an evaluation is sent to them. Short and sharp this may be, but it gets the job done. 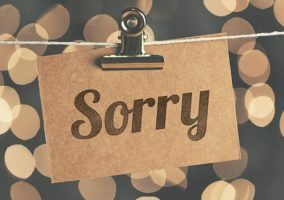 While the use of the word “we” may sound a little corporate – as some contact centres would prefer advisors to use statements that include pronouns such as “I” and “you” – these short signing-off phrases were popular with a number of our professionals. Perhaps this may be a little generic, but it does include a personal pronoun, which advisors are often encouraged to use throughout the call to help customers understand that they are personally involved and interested in them as an individual. Additional Tip – Don’t Just Stick to Just One Statement! One final piece of advice that Dee Chapman gives is to avoid using one call-closing courtesy statement at the end of each interaction. 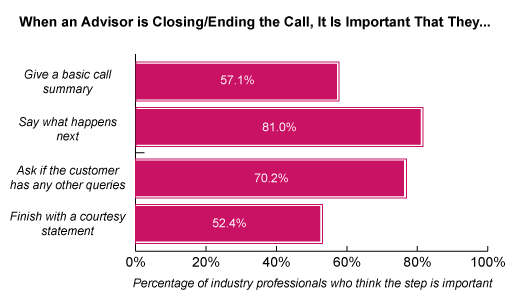 However, in most cases when advisors are closing the call, it is nice to stay upbeat and use an enthusiastic tone. 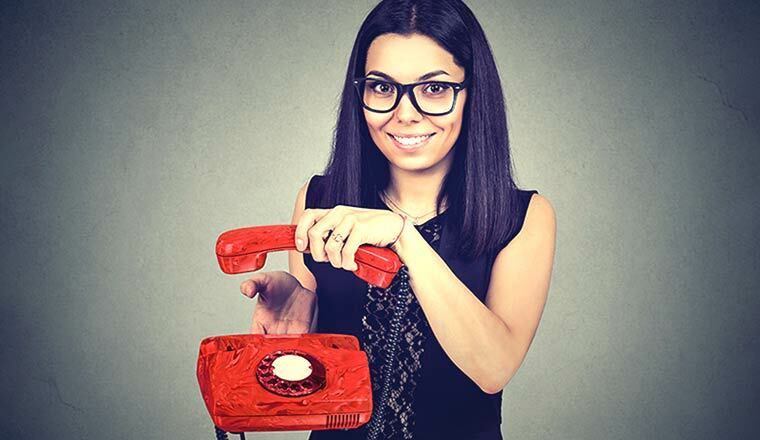 Which other call-closing statements would you suggest contact centre advisors use? Please share your suggestions, as well as any other thoughts, in an email to Call Centre Helper.